^ a b c d e f g Timothy Lubin (2015). Michael Witzel, ed. Homa Variations: The Study of Ritual Change Across the Longue Durée. Oxford University Press. pp. 143–166. ISBN 978-0-19-935158-9. ^ Timothy Lubin (2015). Michael Witzel, ed. Homa Variations: The Study of Ritual Change Across the Longue Durée. Oxford University Press. pp. 143–145, 148. ISBN 978-0-19-935158-9. , Quote: "The homa, the ritual offering of food in a fire, has had a prolific career in Asia over the course of more than three millennia. In various forms, rites of this type have become a part of most of the religions that arose in India as well as their extensions and offsprings from Samarqand to Japan. All of these homas ultimately descend from those of the Vedic religions, but at no point has the homa been stable. (...) The rules of Vedic fire offerings have come down to us in two parallel systems. 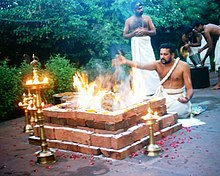 A few of the later exegetical passages (brahmana) in the Vedas refer to cooked food (paka) offerings contrasted with the multiple-fire ritual otherwise being prescribed. (...) several ways in which a homa employing a cooked offering (pakayajana) can be distinguished from a Srauta offering (...)"
^ Richard Payne (2015). Michael Witzel, ed. Homa Variations: The Study of Ritual Change Across the Longue Durée. Oxford University Press. pp. 2–3. ISBN 978-0-19-935158-9. ^ Michael Witzel (2008). Gavin Flood, ed. The Blackwell Companion to Hinduism. John Wiley & Sons. p. 78. ISBN 978-0-470-99868-7. ^ Michael Witzel (2008). Gavin Flood, ed. The Blackwell Companion to Hinduism. John Wiley & Sons. p. 79. ISBN 978-0-470-99868-7. ^ Michael Witzel (2008). Gavin Flood, ed. The Blackwell Companion to Hinduism. John Wiley & Sons. p. 77. ISBN 978-0-470-99868-7. Quote: A thorough interpretation of the Śrauta ritual that uses a wealth of Vedic descriptions and contemporaneous native interpretation is a desideratum. Though begun a hundred years ago (...), a comprehensive interpretation still is outstanding. ^ Musashi Tachikawa (2015). Michael Witzel, ed. Homa Variations: The Study of Ritual Change Across the Longue Durée. Oxford University Press. pp. 126–141. ISBN 978-0-19-935158-9. ^ a b Michael Witzel (2008). Gavin Flood, ed. The Blackwell Companion to Hinduism. John Wiley & Sons. p. 80. ISBN 978-0-470-99868-7. ^ Usha Grover (1994). Pierre-Sylvain Filliozat; et al., eds. Pandit N.R. Bhatt Felicitation Volume 1. Motilal Banarsidass. pp. 59–61. ISBN 978-81-208-1183-6. ^ Michael Witzel (2008). Gavin Flood, ed. The Blackwell Companion to Hinduism. John Wiley & Sons. p. 82. ISBN 978-0-470-99868-7. ^ Timothy Lubin (2015). Michael Witzel, ed. Homa Variations: The Study of Ritual Change Across the Longue Durée. Oxford University Press. p. 153. ISBN 978-0-19-935158-9. ^ a b c Usha Grover (1994). Pierre-Sylvain Filliozat; et al., eds. Pandit N.R. Bhatt Felicitation Volume 1. Motilal Banarsidass. pp. 69–70. ISBN 978-81-208-1183-6. ^ Sanderson, Alexis (2009). "The Śaiva Age: The Rise and Dominance of Śaivism during the Early Medieval Period (University of Tokyo Institute of Oriental Culture Special Series, 23)". In Einoo, Shingo. Genesis and Development of Tantrism. Tokyo: Institute of Oriental Culture. pp. 41–43. ^ Sanderson, Alexis (2009). "The Śaiva Age: The Rise and Dominance of Śaivism during the Early Medieval Period (University of Tokyo Institute of Oriental Culture Special Series, 23)". In Einoo, Shingo. Genesis and Development of Tantrism. Tokyo: Institute of Oriental Culture. pp. 268–269. ^ Mary McGee (2002). Laurie Patton, ed. Jewels of Authority: Women and Textual Tradition in Hindu India. Oxford University Press. pp. 32–37. ISBN 978-0-19-513478-0. ^ Sanderson, Alexis (2009). "The Śaiva Age: The Rise and Dominance of Śaivism during the Early Medieval Period (University of Tokyo Institute of Oriental Culture Special Series, 23)". In Einoo, Shingo. Genesis and Development of Tantrism. Tokyo: Institute of Oriental Culture. pp. 41–43, 268–270 with footnotes.